So writes John O’Sullivan, Editor-at-Large of National Review and a former Special Adviser to Prime Minister Margaret Thatcher. This truism manifests itself in numerous articles, comments and judgments about Hungary and Central and Eastern Europe. James Traub’s article, “Hungary’s 500-Year-Old Victim Complex,” FP, October 28, is an example of O’Sullivan’s observation. The overarching argument of the article is that Hungarians falsify the past to use it as an instrument of the present. The article itself, however, is punctuated with sweeping generalities and omits important historical facts, resulting in a distorted picture of Hungary and the character of its people. A couple of examples will suffice. “Hungarians share a collective pathology known as the ‘Trianon syndrome,” asserts the article. Ever since Trianon, according to the article, Hungarians allegedly have resented the fact that they no longer matter. But what is the real issue? The peace Treaty of Trianon (diktat according to some) following the First World War was arguably the most severe of all the post-World War I settlements. Ostensibly in the name of national self-determination, the Treaty dismembered the thousand-year-old Kingdom of Hungary, a self-contained, geographically and economically coherent and durable formation in the Carpathian Basin and boasting the longest lasting historical borders in Europe. It was imposed on Hungary without any negotiation by vengeful leaders who were ignorant or ignored the region’s history. They mercilessly tore that country apart, overlooking the fact that Hungary was an unwilling partner to the Central Powers. By drawing artificial borders in gross violation of the ethnic principle, it also transferred over three million indigenous ethnic Hungarians and over 70% of the country's territory to foreign rule. The peacemakers even denied the affected populations the right to choose under whose sovereignty they would live. One can imagine how Americans would react to such a calamity. Today it is the lingering consequences of that treaty that concern Hungarians and human rights advocates, not resentment. It is worth noting that Hungary is not the only nation that has been wronged by the major powers in the last two centuries. Russia, Prussia and Austria partitioned Poland three times in the 18th century until the state of Poland ceased to exist. The Polish Republic was only restored on November 11, 1918. Nevertheless its national spirit lived on - so too the national spirit of the dismembered part of Hungary continues as a viable part of Hungarian nationhood and culture. The Hungarian historical communities living in the Successor States, however, are denied a range of rights, including cultural or territorial autonomy, and are forced to live in a stifling status quo that threatens their cultural existence, if not their very survival. They are denied even internal self-determination, such that would enable them to exercise a degree of local self-rule and preserve their unique culture and identity within existing borders. Importantly, the Hungarians of Serbia, Slovakia, Romania, and Ukraine have all demanded autonomy by peaceful and democratic means. Autonomy would ensure democracy to beleaguered Hungarians, fulfill promises made to them ninety-five years ago, and strengthen the democratic process by serving as a model of how majorities and minorities can work together to redress past wrongs. It is time to bury Trianon by extending democracy to Hungarians in place of their current status as second-class citizens in their homeland. As soon they are able to enjoy the fruits of genuine democracy, Trianon will at long last be relegated to the history books. Yet the article is silent about this solution. March 19, 1944, the day an exasperated Hitler occupied Hungary changed everything and had catastrophic consequences for the Jews; 550,000 Jews were deported to Hitler’s death camps by the German Nazis and the Hungarian authorities. Ignoring the German role is as unacceptable as are attempts to whitewash the Hungarian role in the Holocaust. Indeed, the bare bones “willingness” assertion is incomplete history that presents a grotesquely distorted picture of Hungarians. 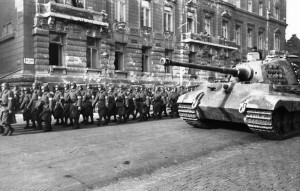 Disregarding history in this manner hardly provides the intellectual underpinnings for an understanding of and an effective foreign policy toward Hungary. *There were pre-invasion atrocities. Germans murdered Jews expelled by Hungarian authorities at Kamenets-Podolsk. The deportations were halted by Hungary’s Interior Minister when he learned of the murders. Following the Novi Sad massacre, the perpetrators were prosecuted by the Kallay government, fled to Berlin and returned to Hungary with the occupying German army. 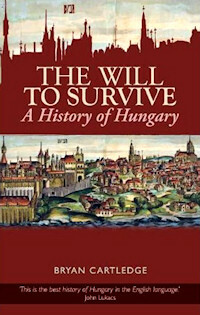 The Will to Survive: A History of Hungary (2007 and published by Columbia University Press in 2011) a highly acclaimed volume by Bryan Cartledge, former British diplomat. Buy it now on the AHF Amazon Store! Unfortunately we must continue to remember Trianon, not merely as a historical event -- “the greatest catastrophe to have befallen Hungary since the battle of Mohacs in 1526,” as noted by Sir Bryan Cartledge -- but as a current problem that needs to be judiciously addressed. What is the current problem ninety-one years after the Treaty was imposed upon Hungary? It is the discrimination, intolerance, and, in some cases, hatred directed toward the Hungarian minorities living in the Successor States. Steps must be taken to ensure that Western values, democratic principles and international norms and practices relating to national minorities will finally prevail in Central and Eastern Europe, thereby at long last relegating Trianon to the history books. In order to better appreciate this current challenge, we must fully understand the history of that ill-advised treaty. And what better person to turn to than Bryan Cartledge, a former British diplomat, academic and author of the highly acclaimed volume, The Will to Survive: A History of Hungary (2007) (published by Columbia University Press in 2011). As we recall Trianon and its consequences this year, we are privileged to be able to reprint Sir Bryan’s Trianon Through British Eyes, presented to Quintess on May 18, 2011. We are grateful to him for giving us permission to reprint his incisive historical analysis of a catastrophe. On the 4th June, 1920, at 4.15pm on a fine, sunny afternoon, a small group of Hungarian officials arrived by car at the entrance to the Grand Trianon Palace, behind the Palace of Versailles, twenty kilometres from Paris. They were led by Ágoston Benárd, Hungarian Minister of Welfare and Labour, and a senior diplomat, Alfred Drasche-Lázár. Fifteen minutes later, the delegation re-emerged from the Palace, having signed a Treaty which formally ended the state of war between Hungary and the Allied powers- principally France, Great Britain, the United States of America and Italy- which had existed since August, 1914 and which had cost over half a million Hungarian lives. Russia, against whose armies most of these lives had been lost, had collapsed into revolution and then civil war three years before and played no part in the negotiation of the peace treaties. The Treaty of Trianon, as it came to be known, not only made peace between Hungary and the victorious Allies: it also formalised Hungary’s loss of two-thirds of her territory, half of her population, two-thirds of her rail, road and canal networks and 80% of her mines and forests. 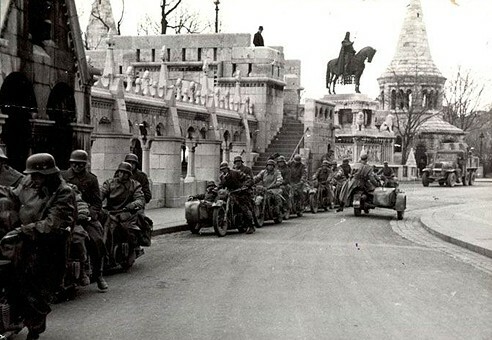 Nearly three million native Hungarians became, on that June day, subjects of the still hostile states of Czechoslovakia, Romania and Yugoslavia. This was the greatest catastrophe to have befallen Hungary since the battle of Mohács in 1526. I shall attempt to trace the genesis of this tragic outcome, from the perspective of one of the authors and principal signatories of the Treaty, Great Britain. Traditionally, British governments had always regarded the Habsburg Empire and its successor, the Dual Monarchy, as a key element in the preservation of the balance of power in Europe which they saw as essential to British security. In 1849, explaining to the British Parliament his refusal to assist Hungary in her struggle for independence from Austria, the Foreign Secretary, Lord Palmerston- no friend of Austria- said that Austria “stands in the centre of Europe, a barrier against encroachment on the one side, and against invasion on the other. The political independence and liberties of Europe are bound up…. with the maintenance and integrity of Austria as a great European power; and therefore anything which tends by direct or even remote contingency, to weaken and to cripple Austria, but still more to reduce her from the position of a first-rate power to that of a secondary state, must be a great calamity to Europe, and one which every Englishman ought to deprecate and to try to prevent.” This remained the British view after 1867, and even after 1914 when the Dual Monarchy, having joined her key ally Germany in waging war on Russia and her allies, became Britain’s enemy. Assuming eventual victory for the Allies, the British Government continued to believe that in post-war Europe Austria-Hungary- perhaps restructured as a federation- would continue to act as a barrier both to Russian expansion and to a renewed German Drang nach Osten. There was also the practical consideration that Austria’s flirtation, from 1916 onwards, with the possibility of concluding a separate peace, would wither on the vine if she were given grounds for believing that a consequence of peace would be the dismantlement of the Monarchy. Initially, the United States seemed to share the British view. President Wilson, addressing Congress on the entry of the United States into the war in 1917, stated: “We do not wish, in any way, to impair or re-arrange the Austro-Hungarian Empire”; and in the speech on 8 January, 1918, in which he proclaimed his famous Fourteen Points, Wilson said that “the peoples of Austria-Hungary whose place among the nations we wish to see safeguarded and assured, should be accorded the freest opportunity of autonomous development”- an admittedly ambiguous formulation. When General Smuts, representing the Allies, met the Austrian Count Mensdorff secretly in Geneva early in 1917 to discuss a separate peace, he gave the Count an assurance that “nobody in London desires the destruction of Austria-Hungary”. But, whether he knew it or not, General Smuts was not telling the truth. Both in London and in Washington, several factors were combining to bring about a radical shift in the traditional view of the indispensability of the Dual Monarchy to stability in Europe. Although the British Prime Minister, David Lloyd George, was able as late as January, 1918 to secure the endorsement of the War Cabinet, and of Parliament, of his view that after the war “Austria-Hungary should be in a position to exercise a powerful influence in south-east Europe”, this position had already been hollowed out by events. The factors responsible for the change in British policy were essentially three: the secret Treaties already concluded by the Allies; the vigorous advocacy of representatives of the national minorities in the Dual Monarchy and of their supporters in the Allied capitals; and, not least, events on the ground in Central Europe. Let us look at these in turn. From 1915 onwards, Britain’s public protestations of her concern to maintain the integrity of Austria-Hungary were profoundly hypocritical. When war had broken out in 1914, Italy had declared her neutrality. Because of her immense strategic importance on the southern flank of the Central Powers, it became a priority objective of the Allies to persuade Italy to enter the war on their side. The secret Treaty of London, concluded in April 1915, promised to Italy, in return for her declaration of war on the Central Powers and on the assumption of eventual Allied victory, large areas of Austro-Hungarian territory including Trentino and south Tyrol, Trieste, Gorizia, Istria, northern Dalmatia, most of the Dalmatian islands and a protectorate over Albania. Italy duly joined the Allies and northern Italy became a major theatre of war for the next three years; when the terms of the Treaty leaked out, as they were bound to do, Croatian troops in the armies of the Dual Monarchy fought the Italians with special fervour to prevent them from realising their claim to northern Dalmatia. The Allies then began to woo another neutral state, Romania. An agreement concluded in August, 1916, promised Romania the whole of Transylvania, the Banát and the Bukovina in return for her declaration of war on the Central Powers. In the meantime, Serbia’s government-in-exile had been promised Austria-Hungary’s recently annexed province of Bosnia-Herzogovina and southern Dalmatia when the Allies had won the war. There may have been a disingenuous distinction, in Allied minds, between the wholesale dismemberment of the Dual Monarchy and the use of its peripheral territories as the currency of international bribery; but even if the core of the Monarchy was to be allowed to survive an Allied victory, as an insurance against German or Russian ambitions, a radical shrinkage of its territory was preordained by these agreements. The second factor which helped to bring about a change in the British attitude towards the long-term future of the Dual Monarchy was the advocacy of the exiled representatives of its national minorities. They saw in the war their best hope of attaining national independence from Austria-Hungary. From 1914 onwards, two energetic Croatians, Frano Supilo and Ante Trumbić, had been campaigning in London to promote the concept of a South Slav (Yugoslav) Federation. In 1915, a Yugoslav Committee was formally constituted in London to pave the way for the creation, after the war, of a single Yugoslav state, uniting the Serbian, Croatian and Slovene peoples in a federation of equals. In 1917 the Committee agreed with the Serbian government-in-exile that the new federal state would be a Kingdom under the Karadjordjević dynasty. Meanwhile, the protagonists of an independent state of Czechs and Slovaks had been equally active and even more successful. Tomás Masaryk had been campaigning in Paris and London since 1914 for an independent Bohemia to which the Slovak regions of Hungary would be joined; Masaryk also urged the British Foreign Office to sanction the concept of a corridor of territory, to be carved out of western Hungary, which would link a new Czecho-Slovak state to the new Yugoslav Federation and give it an outlet to the Adriatic. In this he was unsuccessful. Advocates of Czech, Slovak and Yugoslav independence found strong and influential allies in the British establishment, particularly Robert Seton-Watson, a Scottish expert on Central Europe, and Wickham Steed, the future Foreign Editor of The Times newspaper. Initially well disposed towards Hungary and Hungarians, Seton-Watson travelled extensively in the territories of the Monarchy; he became receptive to, and eventually convinced by, the complaints made to him by the leaders of the Slovak and Romanian minorities concerning ‘Magyarisation’ and the conduct of elections which were neither free nor fair. His three books recording his experiences and impressions were passionately critical of the Hungarian state and of Hungarian policies towards the national minorities. In 1916, Seton-Watson founded a weekly journal, New Europe, in whose columns British and European academics, together with the future leaders of the successor states, promoted the cause of the replacement of Austria-Hungary by a new community of independent nations. Seton-Watson’s powerful connections and Wickham Steed’s talents as a publicist helped New Europe to become a strong influence in policy-making circles. But, quite independently, planners in the British Foreign Office had already reached the conclusion that British policy towards the long-term future of Austria-Hungary was outdated and had to change. In a memorandum dated 7 August, 1916, which was circulated to the War Cabinet, the Head of the Political Intelligence Department, Sir William Tyrrell, and his deputy, Sir Ralph Paget, stated that one of Great Britain’s chief objectives in the present war was “to ensure that all the states of Europe, great and small, shall in the future be in a position to achieve their national development in peace and security….an essential condition of such a peace is that it should give full scope to national aspirations as far as practicable. The principle of nationality should therefore be one of the governing factors in the consideration of territorial arrangements after the war……The future of Austria-Hungary”, the memorandum continued, “will of course depend very largely on the military situation existing at the end of the war. If the situation should be one which enables the Allies to dispose of its future, there seems very little doubt that, in accordance with the principle of giving free play to the nationalities, the Dual Monarchy, which in its present composition is a direct negation of that principle, should be broken up, as there is no doubt that all the non-German parts of Austria-Hungary will wish to secede.” The memorandum concluded with specific recommendations concerning the future of Hungary: “……let Hungary be formed of the purely Magyar portions of the country into an independent state with fully secured commercial outlets to the Adriatic at Fiume and, by means of the Danube, to the Black Sea……If Hungary is, however, to be an independent state with any chance of vitality it would be inexpedient to deprive it of territory beyond that which is necessary to conform to the principle of nationality.” Apart from the implied loss of Transylvania, this was a prescription which, had it been fully adhered to, most Hungarians would have been willing to accept: but, as we shall see, it fell victim to the negotiating processes of the Paris Peace Conference. To sum up the British attitude, a distinct nostalgia for the certainties and stability that the Habsburg Monarchy had seemed to provide lingered on in the older generation of politicians and officials; but it was pushed aside by the enthusiasm of a younger generation for building new democratic states in Central Europe. Meanwhile, a similar re-appraisal of policy towards the post-war future of the Dual Monarchy had been taking place in Washington. Secretary of State Lansing suggested to his President in May, 1918, that the United States should consider whether or not to “favour the disintegration of the Austro-Hungarian empire into its component parts…..giving recognition to the nationalities that seek independence.” In October, Wilson’s response to Emperor Karl’s proposals for informal peace talks made it clear that he was no longer prepared to endorse the integrity of the Monarchy: the Czech, Slovak and South Slav peoples must themselves “be the judges of what action on the part of the Austro-Hungarian government will satisfy their aspirations and their conceptions of their rights and destiny as members of the family of nations.” This was, in effect, a final endorsement for the dismantlement of the Monarchy. Events on the ground in Central and Southern Europe were moving in parallel with the evolution of the secret discussions and public debate in London and the other Allied capitals. As the Allies moved towards acceptance, and then approval, of the breakup of the Monarchy, its component peoples were translating words into deeds. The death of Emperor Franz Josef in November, 1916, had removed a significant factor, Kaisertreue, that had inhibited fissiparous activity on the part of the nationalities. As the tide of war moved conclusively against the Central Powers - István Tisza told the Hungarian Parliament on 17 October, 1918, that the war was lost- the nationalities quickly took matters into their own hands. On 28 October, acting on Emperor Karl’s declaration that Austria was a federal state “in which each racial component shall form its own state organisation in its territory of settlement”, a National Council in Prague proclaimed a Czecho-Slovak Republic and took over the administration of Bohemia-Moravia. On the following day the Croat Diet in Zagreb proclaimed the independent state of Croatia-Slavonia within the new Yugoslav federation. A Romanian National Council, meeting in Arad, proclaimed self-determination for the Romanian population of the Hungarian Kingdom. In Turócszentmarton, the Slovak national parties declared that Slovaks formed part of the Czecho-Slovak nation. In November, the Serbian National Council announced the incorporation into Serbia of the southern counties of Hungary (the western Bánát), already occupied by Serb troops. And finally, on 1 December, the Romanian National Assemby, meeting in Gyulafehérvár, proclaimed the union of Transylvania with the Kingdom of Romania. In other words, without any direct action on the part of the Allies apart from public support for the principle of national self-determination, the Austro-Hungarian Monarchy had imploded. In discussing the antecedents of the Treaty of Trianon, it is important to bear in mind that the overriding objective and priority of the Paris Peace Conference which assembled in January, 1919, was to conclude a peace treaty with Germany which would both insure against a revival of German aggression and extract from that country reparations which would help to defray the massive cost of four years of war. The conclusion of peace treaties with Germany’s allies, which would also serve as the vehicles for a re-arrangement of frontiers in the territory of the former Austro-Hungarian Monarchy and in the Balkans, was naturally accorded lower priority. This secondary objective of the Conference was of course recognised as being of crucial importance for the future peace and stability of Central and Southern Europe; but, involving as it did detailed issues of demography and topography, it could not be expected to engage the sustained interest and attention of the leading Allied statesmen- Clemenceau, Wilson and Lloyd George- to the same extent as the treaty with Germany. The influence of official members of the Allied delegations on the negotiation of these subsidiary treaties was correspondingly greater; and the significance of their composition thereby increased. It was relevant to the future of Hungary, therefore, that the British delegation contained a powerful advocate of national self-determination, James Headlam-Morley, and two known critics of Hungarian policy towards her national minorities, Harold Nicolson and Allen Leeper. Among the delegation’s unofficial advisers were Robert Seton-Watson and Wickham Steed, both acknowledged experts on Central Europe but far from impartial in matters concerning Hungary. The detailed preparation of draft peace treaties with Austria and Hungary, and the re-arrangement of their frontiers, was entrusted to two committees of Allied officials, the ‘Czecho-Slovak Committee’ and the ‘Romanian and Yugoslav Committee’; Harold Nicolson served on the former, Allen Leeper on the latter. When the committees began their deliberations in January, 1919, the ‘givens’ with which they had to work included the de facto existence of two new independent states, Czecho-Slovakia and Yugoslavia; and the status of Romania, which had changed sides at the very last moment, as one of the victor powers, already in occupation of Transylvania. The work of the Committees was complicated by the fact that the four leading Allied powers had differing priorities. The Italians were concerned almost entirely with the acquisition of territory in the Balkans and the Tyrol. The French aimed to maximise their influence in Central Europe and to use the region as a barrier against Bolshevism. The Americans attached the greatest importance to reconciling national self-determination with ethnicity. While the British aimed above all at making the new Successor States economically viable and strategically secure. Added to these disparities was the plain fact that viable economic, defensive or communications frontiers in Central Europe had little in common with each other and virtually none with the ethnic patterns of the region. On specific issues of frontier delineation, the American position was likely to be the most favourable to Austrian and Hungarian interests. Unless the issue affected Italy’s own claims, the Italian representatives were likely to be indifferent. This meant that British and French views, giving priority to the interests of the Successor States over those of Austria and Hungary, usually prevailed. Against this unpromising background, four other factors played a significant part in producing such a disastrous outcome for Hungary. 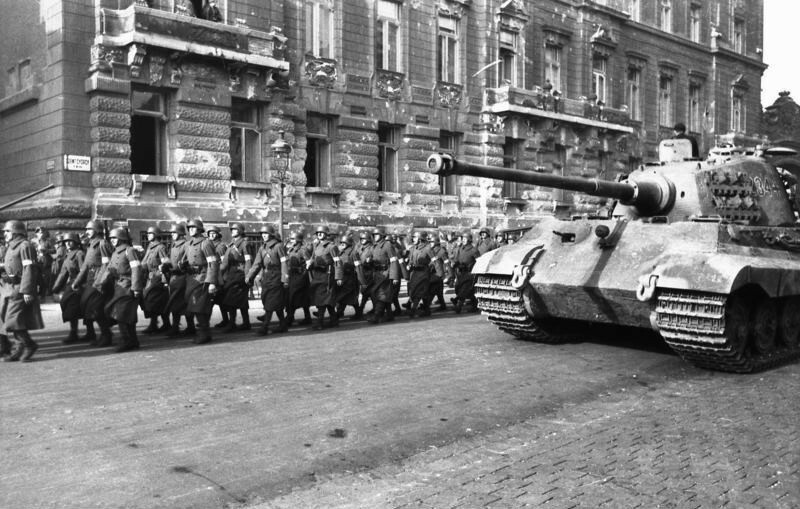 The first was the obvious fact that Hungary, like Austria and Germany’s other allies, was a defeated country. Romania and Serbia, on the other hand, were members of the victorious Alliance and Czecho-Slovakia was treated as if it had been. In matters affecting any one of these three nations on the one hand and Hungary on the other, and in which the Committees found it impossible to do justice to both sides, the decision was always likely to go against Hungary. The third factor was confusion and misunderstanding concerning the manner in which the Peace Conference would eventually be brought to a conclusion. Initially, participants were under the impression that once the Allies had agreed between themselves the terms of draft Peace Treaties there would then be a Congress, attended by the defeated as well as the victorious powers, at which final Treaties would be negotiated. Officials on the territorial committees consequently believed that their recommendations would be modified during the process of negotiation and therefore employed the common diplomatic tactic of building into them ‘negotiating fat’- in other words, constructing a maximalist position from which concessions could, if necessary, be made without damaging their key requirements. In the event, the concept of a concluding phase of negotiation with the defeated powers was abandoned in favour of final texts which were to be imposed upon the countries concerned, subject only to very minor adjustments. The maximalist drafts composed by the two Committees, therefore, became final texts with the ‘negotiating fat’ untrimmed. Harold Nicolson subsequently commented, on the Versailles Treaty: “Had it been known from the outset that no negotiations would ever take place with the enemy, it is certain that many of the less reasonable clauses of the Treaty would never have been inserted.” His comment applied equally to the Treaty of Trianon. Finally, the factor which more than any other contributed to the extreme severity of the Treaty of Trianon was the absence of Hungarian representatives from Paris during the crucial period between 12 March, 1919, when the territorial Committees completed their work and submitted their recommendations to Ministers, and 12 May when the Council of Five Foreign Ministers approved them. The Allies had ignored Count Mihály Károlyi’s pleas to be allowed to send representatives of his National Council to Paris, on the grounds that there could be no negotiation with the ‘enemy’; and on 21 March, 1919, the National Council was replaced by a Revolutionary Governing Council, led by the Communist Béla Kun. Given Allied, and particularly French, fears of the spread of Bolshevik influence into Western Europe, there could be no question of inviting representatives of the new Hungarian Republic of Councils to Paris. By contrast, the Chancellor of Austria, Karl Renner, and his delegation had arrived in the French capital in early June and worked hard for several weeks to secure significant modifications to the first version of the Treaty of St. Germain, including the award to Austria of a strip of territory in western Hungary containing the historic Hungarian town of Sopron. There was, indeed, one Allied statesman who was prepared to speak up for the interests of absent Hungary- the British Prime Minister, David Lloyd George, who wrote a Memorandum, dated 25 March, 1919 entitled “Some Considerations for the Peace Conference Before They Finally Draft Their Terms”. After stressing the long-term dangers of imposing too harsh a peace on Germany, the Memorandum continued: “What I have said about the Germans is equally true of the Magyars. There will never be peace in South-Eastern Europe if every little state now coming into being is to have a large Magyar Irredenta within its borders. I would therefore take as a guiding principle of the peace that, as far as is humanly possible, the different races should be allocated to their motherlands and that this criterion should have precedence over considerations of strategy or economics or communications, which can usually be adjusted by other means.” To the great misfortune of Europe in general and of Hungary in particular, this remarkably far-sighted statement was ignored- not only by the other Allies but even by British officials and other Ministers in Lloyd George’s own government. Moreover, the date, 25 March, on which the Memorandum was circulated was the very day on which the Council of Four met to discuss Béla Kun’s Communist take-over in Hungary and to hear a violently anti-Hungarian tirade from Clemenceau, who argued for immediate military intervention in Hungary. Lloyd George and President Wilson took a more moderate line and secured agreement to the despatch to Budapest of a mission headed by General Smuts to investigate the situation there. This represented Hungary’s last chance to open a dialogue with the Allies which might have led to an invitation to send representatives to Paris; but Kun rejected the concessions offered by Smuts, arguing for more. Smuts returned to Paris, having concluded that Kun was not to be taken seriously and would not last long. By November, 1919, when the Kun nightmare had been succeeded by the Romanian occupation and when, finally, a coalition government of democratic parties had been established in Budapest, the conditions at last existed which allowed the Paris Conference to invite Hungary to send representatives to appear before it. The invitation was extended on 1 December. But by this time the main work of the Conference was over. The crucial peace treaty with Germany, the Treaty of Versailles, had been signed on 28 June. President Wilson had returned to the United States. The Italians had withdrawn from the Conference in April, in protest against the alleged flouting of Italian interests. The Treaty of St. Germain, formalising peace with Austria, had been signed in September. All participants in the Conference were tired and ready to return home. Concluding peace with Hungary was a tiresome piece of unfinished business. Against this background and in this atmosphere, the Hungarian delegation to the Conference, led by Count Apponyi, would have well advised to concentrate on securing detailed modifications to the terms of what became the Treaty of Trianon, which were presented to them on 15 January, 1920. This was the strategy which Chancellor Renner had adopted, with some success. Instead, Count Apponyi, when he addressed the Supreme Council on the following day, attacked the whole concept of territorial dismemberment which the Treaty spelled out: he developed, with great eloquence in French, English and Italian, all the historical, geographical, economic and cultural arguments for maintaining Hungary’s territorial integrity. Objectively, and given the drastic character of the Treaty’s terms, Apponyi’s approach was fully justified. But it was simply too late for an onslaught on the entire draft Treaty, root and branch; there could be no question of persuading the Allies to tear it up and start again. In the discussion which followed Apponyi’s long oration, Lloyd George tried to steer him away from wholesale rejection and towards detailed modification by asking him for details of the numbers and locations of the ethnic Magyars who would find themselves outside Hungary under the Treaty’s terms: this enabled Apponyi to produce Pal Teleki’s famous map of historic Hungary’s demography, which made some impression on the Allied statesmen who clustered around it but was soon forgotten. During the weeks that followed, Lloyd George and, with less enthusiasm, the new British Foreign Secretary, Lord Curzon, continued to argue for some amelioration of the sacrifices which were to be imposed on Hungary. In February, Curzon told his fellow Heads of Delegation that the Hungarian response to the draft Treaty could not simply be ignored: the territorial and economic issues raised in the eighteen Notes which Hungary had addressed to the Conference should be carefully considered at the highest level. On 3 March, Lloyd George pointed out to the Allied Heads of Government that the Treaty, as it stood, would leave one third of the Magyar population of Hungary under foreign rule: there would be no peace in Central Europe, he argued, “if it were discovered afterwards that the claims of Hungary were sound and that a whole community of Magyars had been handed over like cattle to Czechoslovakia and to [Romania], simply because the Conference had refused to examine the Hungarian case”. But the die was cast. The Conference was breaking up- the Supreme Council had held its last meeting on 21 January, 1920. The new French Prime Minister, Millerand, was adamantly opposed to any amendment to the existing text of the Treaty. Sadly for Hungary, he was joined in this opposition by the British Foreign Office, which submitted to the Council of Ambassadors and Foreign Ministers (which had replaced the Supreme Council) a memorandum arguing passionately against any modification of the territorial clauses of the Treaty, on the grounds that this would be regarded by the Successor States as a serious breach of faith, undermining the entire peace settlement. Curzon recommended that the Council should approve the Memorandum; but in return he did secure French agreement to a new provision in the Treaty. This laid down that if the Frontier Delimitations Commission (the body appointed to supervise the implementation of frontier changes on the ground) “found after due enquiry on the spot that in certain areas injustice had been done and modifications were required, they should be at liberty to report their conclusions to the League of Nations.” This was a very small concession to the Hungarians- and the only one- but better than nothing. The Treaty of Trianon, its Annex defining frontier changes virtually identical, word for word, with the recommendations of the two territorial Committees, was signed, as we know, on 4 June, 1920 and subsequently ratified by the Hungarian Parliament. It was not intended to be punitive although that was its effect. Its severity and undoubted injustice resulted from a series of events- some avoidable, some not- which were uniformly adverse for Hungary. The determination of the former national minorities of the Monarchy to achieve independence within viable national frontiers was unstoppable, as was the will of the Allies to help to bring this about. The refusal of the Allies to help Károlyi to remain in power was avoidable and foolish, as was Károlyi’s resulting abdication of power to the Communists. Hungary’s tactics when she was at last permitted to state her case in Paris were unwise and did the Hungarian cause no favours. No country, and no statesman- with the possible exception of David Lloyd George - emerged from the gestation of Trianon with any credit. It was a dark and discreditable chapter in the history of international diplomacy. Sir Bryan Cartledge KCMG (born June 10, 1931) is a former British diplomat and academic. After studying at Hurstpierpoint College and the University of Cambridge, he took research posts at St Antony's College, Oxford and the Hoover Institute at Stanford University. He was inspired to become a diplomat after being invited to assist the former British prime minister and foreign secretary Sir Anthony Eden with his memoirs. In the British Diplomatic Service, Cartledge served in Sweden, the Soviet Union and Iran before being appointed, in 1977, to be Private Secretary (Overseas Affairs) to the British Prime Minister; he served both James Callaghan and Margaret Thatcher in that capacity before taking up his first ambassadorial appointment as British ambassador to Hungary in 1980. He then headed the Defence and Overseas Secretariat of the Cabinet Office, as deputy secretary of the British Cabinet, before returning to Moscow as ambassador, where he had regular dealings with Mikhail Gorbachev and Eduard Shevardnadze. Cartledge left the Diplomatic Service in 1988 on his election to be principal of Linacre College, Oxford. In Oxford, he has edited six books on environmental issues. He holds diplomas in the Hungarian language from the Universities of Westminster (UK) and Debrecen (Hungary). His history of Hungary, The Will to Survive, fulfils an aspiration which grew out of his deep interest in the country where he served three years as ambassador. Buy his books on the AHF Amazon Store! 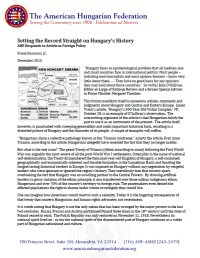 "Trianon 1920-2014: Not History Until Minority Rights Respected and Granted"
"AHF remembers the ill-advised treaty and publishes "Trianon Through British Eyes," by Sir Bryan Cartledge who called the treaty "the greatest catastrophe to have befallen Hungary since the battle of Mohacs in 1526."